Striking workers at a previous protest at Amazon’s flagship Madrid warehouse in March 2018. The second day of a three-day strike by Amazon warehouse workers near Madrid coinciding with the e-commerce giant’s Prime Day promotion escalated significantly on Tuesday, with trade unions telling Spanish newspaper Público that police in riot gear had charged the strikers multiple times on supposed grounds they were blocking traffic. Police arrested at least two participants in the protest, with one worker allegedly hit in the face with a truncheon and losing teeth as a result. One photo shared by Alberto Rodriguez, a member of Spain’s Congress of Deputies, appeared to show a blood-soaked shirt in front of the Amazon warehouse in Madrid province’s San Fernando de Henares municipality. Videos flagged by Público appeared to capture at least one beating by police. The workers at the Madrid facility, nearly half of whom are temps, had previously gone on strike in March. This week, they are demonstrating not only against what they said were grueling work conditions, low compensation, and conditions placed on time off, but the expiration of a collective bargaining agreement in 2016 that Amazon has taken advantage of to chip away at previous levels of benefits, according to the Financial Times. Público wrote that other than the actions of police, union representatives said the protest was peaceful. According to El Diario, union delegate Douglas Harper contested police accounts of organized attempts to block traffic and said that the charges began after a woman, a minor, that was with the strikers left the sidewalk onto the road. Police officers guard the Madrid-region Amazon warehouse in question during a prior strike in March 2018. Público added that the demonstrations appear to have significantly cut down on Amazon’s ability to fulfill shipments from the warehouse. 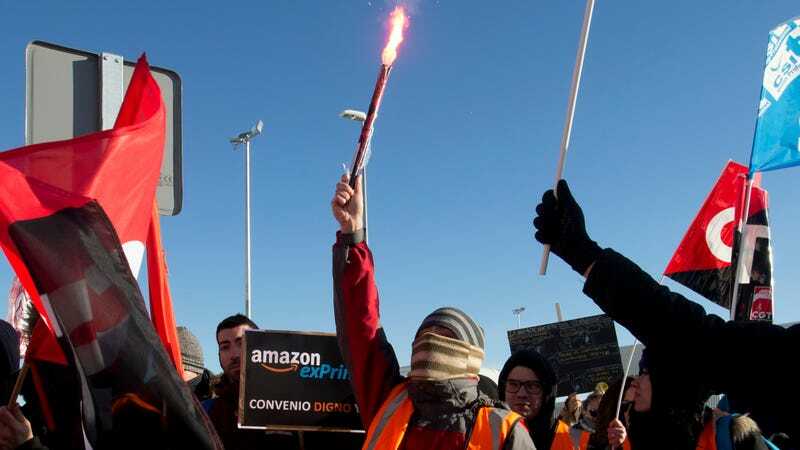 According to the Washington Post, labor organizers say 96 percent of the warehouse’s workforce joined the strike, while the Financial Times reported the Confederación Sindical de Comisiones Obreras union (Spain’s largest) said that only 80 workers of the 1,400 in Madrid were left at their posts on Monday during the Prime Day promotion. Amazon contested those figures, telling both papers that a majority of workers opted to continue working. According to the Financial Times, similar strikes in Germany saw some 2,500 to 3,000 “of the company’s 16,000 workers in its largest market outside the US” walk out on Monday, per figures provided by services union Verdi. However, Amazon similarly disputed those numbers. As the Amazon workers in Spain, Germany, and another cohort in Poland went on strike this week, CEO Jeff Bezos ascended to the rank of wealthiest man in recorded modern history. Update 7/18/18 10:47am ET: With help from our colleague Carlos Zuhamensky at our Spanish-language offshoot Gizmodo ES, we were able to speak with Juan Manuel Rosado, a spokesperson for the CSIT union in the Amazon Company Workers Committee about yesterday’s violent clash. His words have been transcribed and translated by Zuhamensky. Rosado went on to accuse Amazon of diverting work from MAD4 to a newer facility in Barcelona which has no union presence or workers’ committee, moves he believes hurt the strike efforts. Still, the hope for better conditions didn’t end with this Pride Day action. “There are several trials that will begin in September. CSIT sued Amazon for what we think is acting in bad faith trying to impose a unilateral collective contract,” he said.